Please email at explorekohchang@gmail.com if you are interested in any of our Villas, Houses and Condos for Sale in the Koh Chang Islands. Condos for sale as part of this Phase 2 property development on the south coast of Koh Chang. Oceanview 1 bedroom condos at 60sqm, top floor penthouses at 120sqm. Fully fitted and furnished. Estate management, swimming pool, spa, gym, private jetty. Luxurious 500sqm Koh Mak villa for sale. Twin Lanna style, 5 bedrooms, 6 bathrooms, fully equipped kitchen, verandahs and balconies, 2.2 rai of Chanote land, mature tropical garden. Rentals business in place, website included in sale. Freehold. One of the most stylish west coast properties on the Koh Chang property market, this unique Balinese villa is now available for immediate sale. Private and secluded, the hillside villa is built over 2 floors with 3 bedrooms, 3 bathrooms, open plan living space with kitchen, plunge pool and carport. Freehold. New to the Koh Chang property market, this luxury villa on the east coast is now available at a reduced price for a quick deal. Built in a U-shaped lay-out over two floors, the luxury villa has 4 double bedrooms, 6 bathrooms, kitchen, dining area, living room, balcony and outdoor terrace. At the villa centre sits a fabulous rectangular infinity pool, from which lawned gardens lead down to the ocean. Freehold. Luxury comes to the Koh Chang property market with the arrival of this fabulous villa on the east coast. On the ocean front, this huge family villa is built over two floors, with 4 bedrooms, 5 bathrooms, dining room, living room, fitted kitchen, infinity swimming pool. Available now. On the quiet Koh Chang east coast, this elegant 2 storey house is an exciting new addition to the Koh Chang property market. House comprises 4 bedrooms, 3 bathrooms, living room and kitchen, all laid out over 2 floors, fully air-conditioned, terraces for outdoor seating and those ocean views. New to the Koh Chang property market, this wonderful and unique artist inspired B&B is now available for immediate purchase on the east coast. Chanote land, two bungalows, owner accommodation, turnkey, all fixtures and fittings. Now open to immediate offers, this stylish modern villa sits on the quiet Koh Chang east coast. With 3 bedrooms, 3 bathrooms, open plan kitchen and living area, it also represents a terrific turnkey holiday let business opportunity. All fixtures and fittings included. Located on the quiet east coast in a small private housing development, this 2 storey property would make an excellent holiday or retirement home. The house has 3 bedrooms and 2 bathrooms, open plan kitchen with living space and sits 30 seconds from the communal pool. It also stands as an assumable ongoing holiday rental business, with management already in place. Situated on the west coast near to the ferries, this charming 2 bedroom villa is now available for immediate sale. Ideal holiday home as well as an excellent rental income opportunity. All fixtures and fittings included. A unique project new to the Koh Chang property market, this huge unfinished villa is situated roadside on the west coast about 5 minutes from Ao Sapparot Ferry. The unfinished villa can be used as a holiday home, maybe a guesthouse, maybe a holiday rental, it really is up to you and with purchase now, it can be designed and fitted to your specifications. 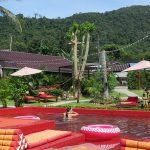 Unique development of Koh Chang beach houses available for immediate sale. Fabulous location, popular beach. 30 yr lease, from 1.95m THB, rental management plan. Island Life Condominium is a new condos development to be built over 3 rai of land (approx 4,800sqm) just 120m from the sea and sand at Kae Bai Beach. With 106 units ranging from studio to 2 bedroom to VIP spread over 2 low rise 4 storey buildings, the condos will be an ideal investment for those wanting a holiday home in Thailand.